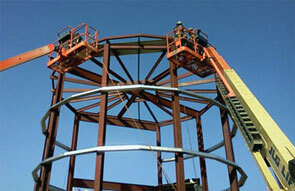 Structural steel shape, size, composition, strength, storage, etc., is regulated in most industrialized countries. Structural steel members, such as I-beams, have high second moments of area, which allow them to be very stiff in respect to their cross-sectional area. An I-beam, also known as H-beam, W-beam (for "wide flange"), Universal Beam (UB), Rolled Steel Joist (RSJ), or double-T (especially in Polish, Spanish, Italian and German), is a beam with an I- or H-shaped cross-section. The horizontal elements of the "I" are flanges, while the vertical element is the web. The web resists shear forces while the flanges resist most of the bending moment experienced by the beam. Beam theory shows that the I-shaped section is a very efficient form for carrying both bending and shear loads in the plane of the web. On the other hand, the cross-section has a reduced capacity in the transverse direction, and is also inefficient in carrying torsion, for which hollow structural sections are often preferred.